Last month, I made my first barbeque sauce, and it was incredible! If I do say so myself. And I do. So I had to make it again – to see if it was a fluke or the real deal. Guess what – it’s amazing! You’re going to love this sauce! It’s a little sweet, a little spicy, just a hint of smoke… so good. I know, making your own is an extra step and who has time for that, right? I never have time to make complicated meals on a weeknight, but I like to eat those meals, so I try to plan ahead when I can. We do lots of make-ahead meals in the Juggling Act household! 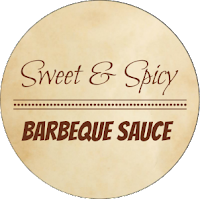 Here’s how to make and can your own barbeque sauce. You can tweak the flavors to suit your pallet, but this is pretty near perfect. If I do say so myself. And I do. To make the barbecue sauce, start with a medium-sized saucepan on medium heat. Dice the onion and cook in the oil until translucent. Add the minced garlic and cook for another minute or so, taking care not to burn the garlic. Add the rest of the sauce ingredients and bring to a boil. Turn the heat town to low and simmer for about 30 minutes. I used an immersion blender to give the sauce a smoother consistency. You could use the sauce right away, I poured mine into a mason jar and refrigerated it until needed. To can the sauce, first prepare all your jars, lids and bans. I run mine through the dishwasher to sanitize. Have your water bath ready so you can process the jars as soon as you have them prepared. Set a kitchen towel on the counter next to your pot, and arrange the jars on the towel. 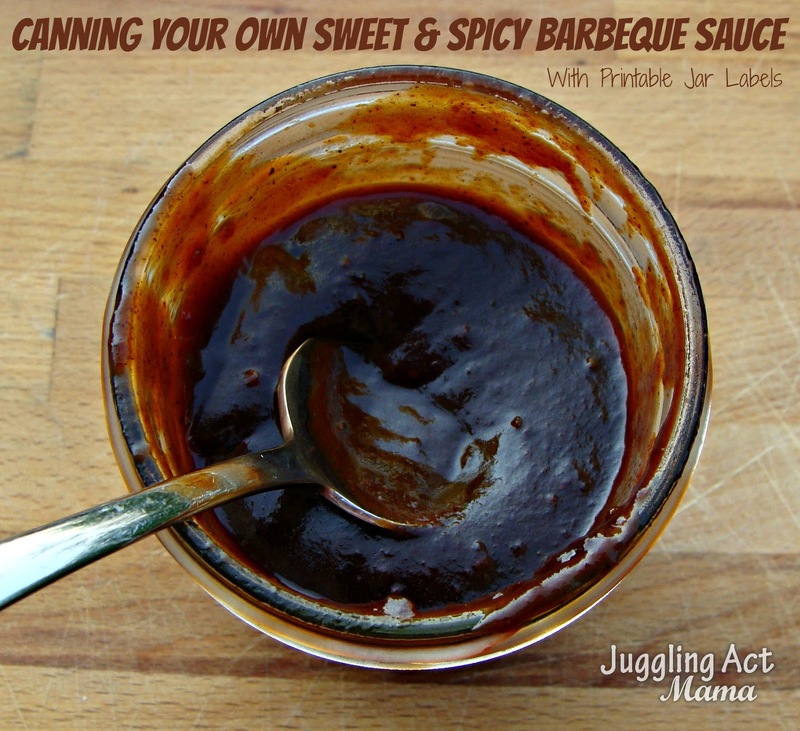 Using a funnel, fill the canning jar with the hot barbeque sauce, leaving 1/2″ headspace. Take care not to drip it on yourself – ouch! Wipe the rim of the jar clean with a damp paper towel. Place the lid and screw on the cap – I use another kitchen towel to tighten the lids since the are hot. Process the jars in a water bath for 35 minutes. Remove the jars back to the kitchen towel to cool and wait for that lovely plink sound (any that don’t properly seal should be refrigerated immediately). 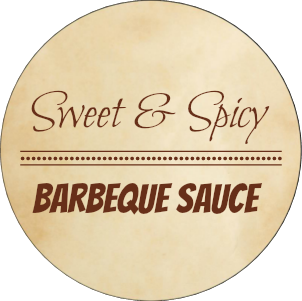 Don’t worry if that happens – I have a couple of fabulous recipes to use it up – Try my Sweet & Spicy Barbecue Ribs or Sweet and Spicy Crockpot Chili – and stay tuned for some more great barbeque recipes coming soon. Once the jars cool, you can unscrew the pans and add these pretty little labels – they fit perfect on a canning jar lid. (Use Avery 5294 or similar labels – 2″ circles). Download the labels here. What would you put this barbeque sauce on? This is wonderful! 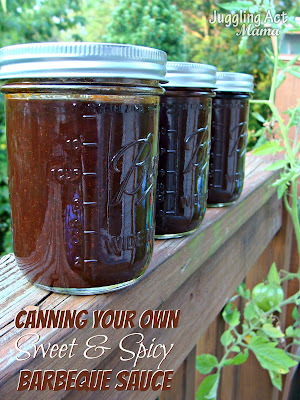 I am really looking forward to canning more this year and sauces and jams are something I want to get into! I love the flavors you have pumped into it. Pinned and tweeting. 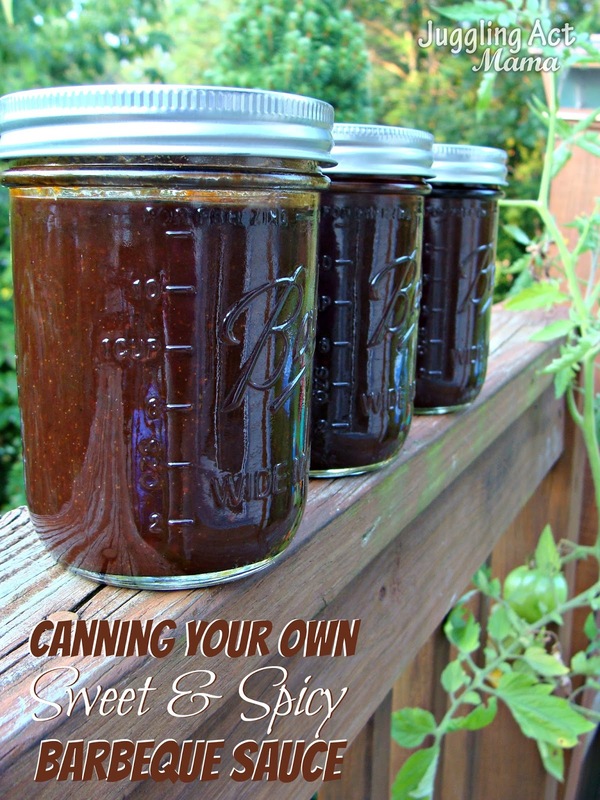 I love canning and I love BQ sauce, so I will definitely give it a try! I bet this is AMAZING! My mom used to make bbq sauce whenever I was a child and I remember it was so good! Do you have to use onions since I don’t have an immersion blender? Hi David! You have a couple of options… the onions really add awesome flavor so it’s shame to leave them out. If you have a regular blender, you can put the mixture in there and whiz it up. You could also minced the onions very tiny. I would say leaving them out is a last resort as it will change both the flavor and texture of the BBQ sauce. Hi Debi! Great question, I’ve updated the post to make it more clear in the future. Any jars that don’t properly seal after canning should be refrigerated immediately, but the rest can be kept on a shelf in your pantry.